Transform your kitchen for just a fraction of the cost you would pay out on a complete kitchen renovation, by simply replacing the outdated doors, drawers and lights. 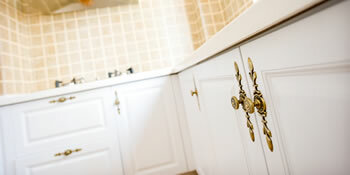 By keeping the old carcass of your kitchen cupboards, you’ll slash the expense of upgrading your home and will still have a finish to be proud of. The kitchen doors are the first thing you’ll see when walking into the room, defining the character and atmosphere of the kitchen. And with the style of kitchens changing over the years, designs have become a lot lighter and cheerful. Many homeowners are turning away from the traditional solid pines and dark oaks, replacing their kitchen doors for a modern effect at a cheaper price. In fact, the transformation as a whole can be remarkable. Of course, national kitchen suppliers won’t tell you this. They still hope to charge customers extortionate prices for a brand new kitchen and don’t want consumers using this effective and cheaper way of altering the kitchen’s look. Replacing kitchen doors, drawers and other small accessories such as lights, will only take a professional one of two days. On top of this there will be very little mess or upheaval like there would be for a whole kitchen refit. There’s not the need for plumbers, decorators, tilers and electricians, cutting the time it’ll take to change your kitchen and slashing your costs. Bored of your kitchen and want to make a change to freshen things up, without spending thousands of pounds on an entirely new design? Then consider replacing your kitchen doors. Continue to work from your kitchen during the fit. If you’re interested in modernising your kitchen without the stress, hassle and financial burden of a complete overhaul, consider replacing your kitchen doors. Complete our quick form and receive up to four FREE replacement kitchen door quotes from vetted and reputable professionals in your area. Project: We are exploring possibilities regarding our kitchen - most likely a combination of some new furniture and some kitchen door replacement, as well as worktops. Interested in a home visit and quote. They got back very quickly, however they have called everyday since chasing for a decision, a bit to pushy form, I like to think about it before I make a decision. Homes are given an energy score depending on just how efficient they are and ratings are displayed in the data below. This varies from A, by far the most energy efficient, to G, the least efficient. With a higher rating you're more likely to have less costly energy bills as more heat will probably be kept in your house. It is possible to improve your home's efficiency with insulation including double glazing, loft lagging or wall cavity insulation. The data below shows the numerous types of houses in Uk. By far the most common properties across the UK are detached and semi-detached homes. Other types of houses consist of terraced houses, flats, converted flats and bungalows. The information beneath provides an indication for the number of homes in Uk which are central heated and non-central heated. Households are heated by a range of sources which indicate how pricy yearly energy bills are going to be. Examples of central heating include gas, electricity, oil, solid fuel and LPG boilers. Changing exactly how your house is heated could see you with cheaper bills. The information below illustrates the spread of houses heated by various fuels. Around the United Kingdom the most frequent undoubtedly are gas heated homes, followed by electricity and then oil. Biomass central heating boilers are also increasing in popularity, heated by sustainable products such as wood pellets or agricultural waste.|Homes in Britain are warmed by a number of fuels, including gas, electricity, oil, solid fuel and LPG boilers. Each fuel has a varying cost associated with it and that means you might find yourself with cheaper energy bills by changing the way your house is heated. Even solar thermal panels are being regarded as by many people in order to reduce heating bills for the many years to come.